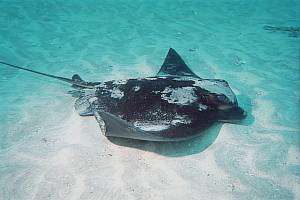 The stingray has earnt its bad reputation from the sharp and often poisonous sting on its tail. But in the thousands of encounters underwater, the animal has never threatened me. 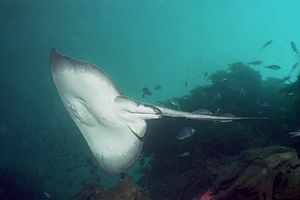 Here in New Zealand we know three species of stingray: the short-tailed ray, the long-tailed ray and the eagle ray. 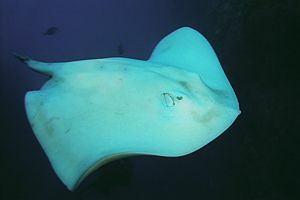 Stingrays have a unique body design, as they fly like birds in the sky. 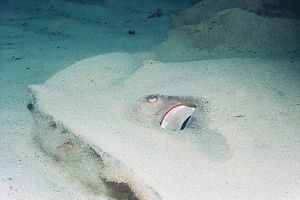 Stingrays do not have float bladders, so they are not easy to spot by the sonar of their arch enemy, the orca. Furthermore, they are adept at burrowing themselves underneath the sand, with only a casual flick of their wings. 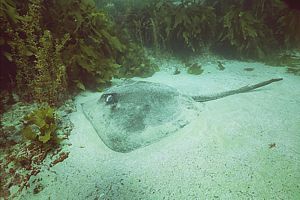 Even though they have bad eyesight, stingrays are reasonably intelligent, as they can grow quite old. 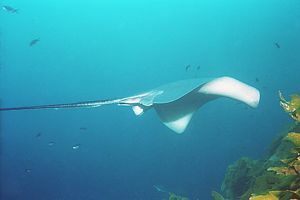 The short-tailed ray holds the record, as it can grow to a wing span of 3.5m, weighing over 500kg. I've once seen such a monster and I had to back off before I realised what it was. 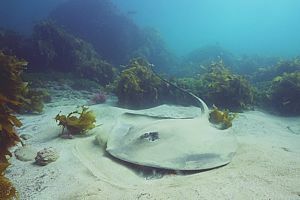 Visit more about sting rays and diver experiences in our Poor knights chapter. f021005: eagle rays are New Zealand's smallest stingrays. They have protruding heads, 'shoulders' and whiplike tails, with a small fin on top. They mainly eat molluscs, like the robust Cooks turban snail, but scallops are also welcome. 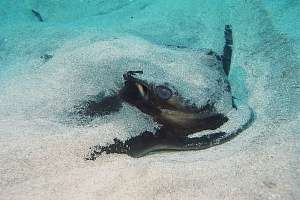 Because of its food preference, the eagle ray is not common around offshore islands. 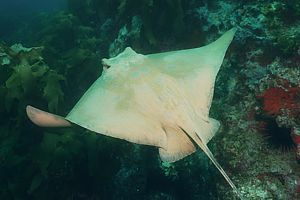 f002312: eagle rays seek out Cooks turban shells, and are even capable of travelling underneath the dense kelp canopy, by folding their wings upward, and snaking their bodies between the upright stalks. The shell is taken to a gravelly 'munchy-spot' where it is cracked with enormous exertion. 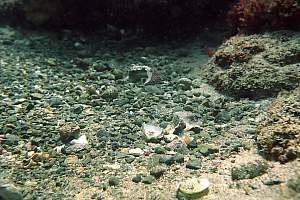 Divers often find the pearly remains of such meals, as shown here. 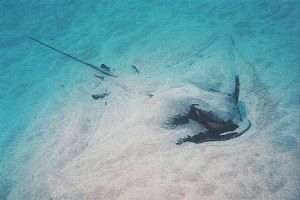 f021001: Eagle ray lightly burrowed under th loose sand, as it forages. f021002: closeup of eagle ray shows pronounced head and large eyes. 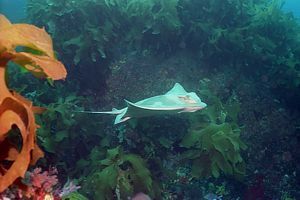 f034909: a light coloured eagle ray moving like a ghost amongst the foliage. 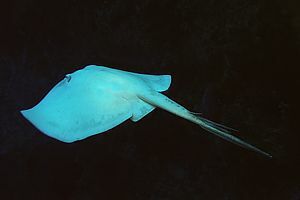 f034912: this large but light-coloured eagle ray is quite unusual. We thought it may be moulting its skin. f005814: Eagle rays and sting rays truly fly in the water, but in order to do so, the water must flow freely over and under their wings. 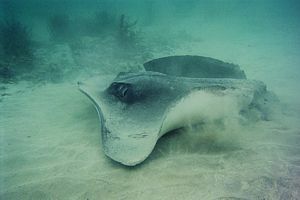 So when alarmed, an eagle ray props itself up as if standing on landing gear. From this position it can take off very quickly. f041228: The baby eagle ray on left is only a few days old, yet perfectly capable of looking after itself. 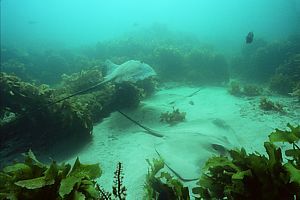 In this photo it is dwarfed by the mature short-tailed stingray (note pointed snout) on right. 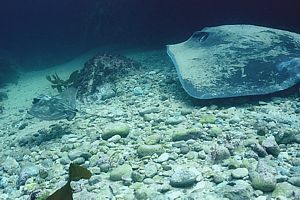 One may forgive baby eagle rays for being very shy. f020511: in Northern Arch (Poor Knights), some 15 years ago, a couple of stingrays had fun mastering the difficult skill of hang gliding on the rising current. Others started to imitate, and their numbers gradually grew to around fifty. Then a pod of orcas massacred some, while scaring others. Hopefully they will resume this spectacular form of socialising. 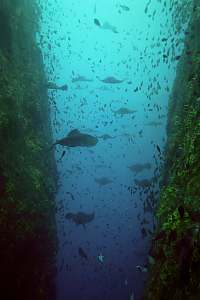 bio11: Northern Arch is a gap of 40m deep in a vertical wall of a promontory. 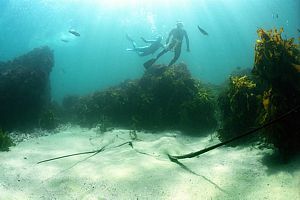 The tidal current pushes itself through the gap, distorting along the sides and rising upward over the ledge. 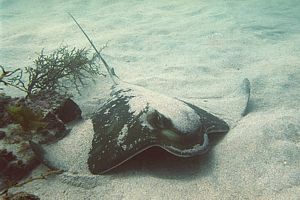 This allows sting rays, who don't possess swim bladders, to spread their wings while staying in one place. It is a form of hang-gliding. f021101: When caught in a trawl net, stingrays are fortunate to stay alive, but at the expense of their tails. Fishermen take no risks with angry stingrays flailing around on deck. 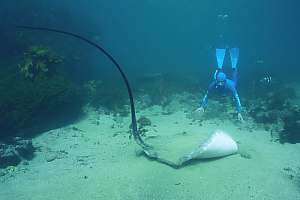 f021102: this rather large female short-tailed stingray has survived quite happily without her tail. She must now be over 25 years old, spanning over 1.5m across her wings. f029223: short-tailed stingrays usually burrow meticulously, but apparently they are well aware of some very safe spots where they let their guards down. 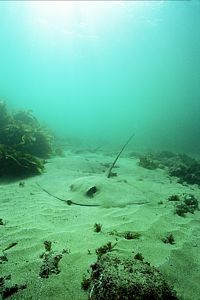 f036124: This very large short-tailed stingray is apparently unperturbed by the photographer swimming so close by. 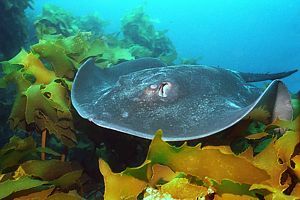 f034915: A large short-tailed stingray skimming the kelp canopy. Why they do this is not certain, but they may just make a low (sonar) profile for their enemies (orca). f038733: A male short-tailed stingray showing its belly as it veers up over a cliff. In front its mouth and nostrils, and above the middle its gill outlets. f041736: This male sting ray is hanging a sharp right turn around a stand of kelp. f020509: Albino sting rays are not altogether rare. On this day, two were swimming among 50 normal ones. f020510: this smaller albino sting ray has three barbs on its tail. 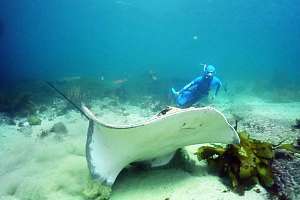 f029213: as a snorkeldiver approaches, this female long-tailed stingray carefully turns herself while lifting her tail in order not to touch either the diver or the photographer. f029214: The stingray then tracks back over the photographer while stroking him over the entire length of her belly. Interest is mutual. f029221: Long-tailes stingray and freediver. f034900: This image captures the gracious lines of a long-tailed stingray. 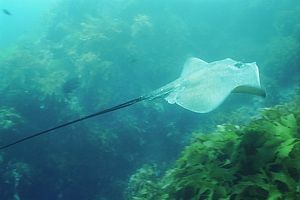 f034901: Long-tailed stingray leisurely cruising through a kelp gully. 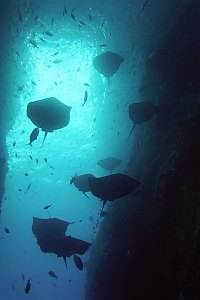 f029215: Long tailed sting rays often rest together. Three can be seen in this picture. f029217: This long-tailed stingray is truning away from the photographer as he was just a bit too pushy. f041508: Stingrays never cease to amaze, partly because of their shape and size but also for their undeserved reputation. Here a boy and girl keep their distance from two stingrays huddled together on the sand. f029208: Sting ray, light and sand. Birds have wings with bones and muscles inside, and feathers outside. Bats have wings in the form of a thin skin between their fingers. Flying squirrels have a loose pelt between arms and legs with which they can glide from tree to tree. Flying fish have extended breast fins that allow them to soar up to 10m high and some 100 metres along. Aircraft have wings made from aluminium, helicopters have narrow wings that spin, . . . and so on. 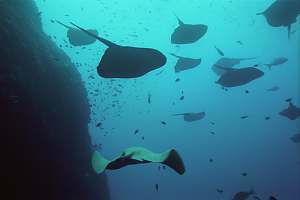 Rays are 'primitive' cartilegeous (soft-boned) fishes whose bodies have flattened sideways. So their wings are just part of their flat bodies. But they truly use these for 'flying' through the water. 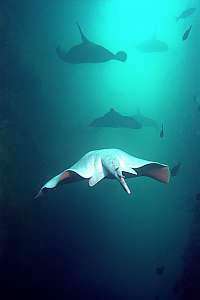 The eagle ray indeed flies like a bird, effortlessly and elegantly, travelling considerable distances even for just a meal. 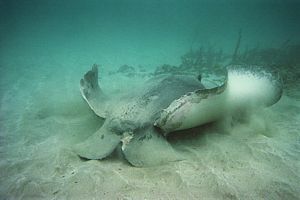 The short-tailed stingray is so strong that it can take off or reverse with a loud bang caused by cavitation. Cavitation happens when the water cannot swiftly follow the wing movement, resulting in a vacuum. As the water catches up, the vacuum collapses with a loud bang. The stingray's arch enemy, the orca can do so too with its mighty tail. 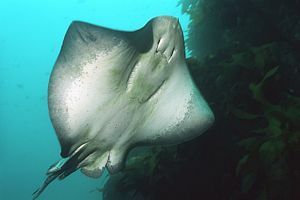 The short-tailed stingray is often seen 'fluttering' its wings, rippling their wing tips in a playful and semi-erratic way.